Welcome to the beautiful neighborhood of Panorama located in Cathedral City, Ca. This model home boasts one of the bigger floor plans you can ask for in this area with 2354 sq ft. Freshly painted, with swimming pool. Home is solar powered, seller is willing to show electric bill to verify they pay under 1,000 for the entire year. Front yard is fenced in making it easier to watch your kids and pets and backyard has brick fence all the way around giving you plenty of privacy. Property is being sold with leased solar, and buyer to apply for existing solar and must qualify as part of purchase. Seller will not pay off solar. Don't miss your chance to live in one of the best communities the desert has to offer. 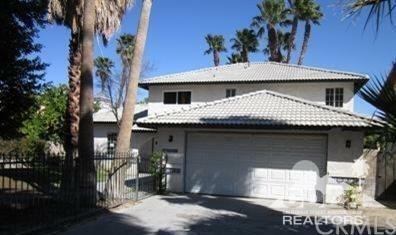 Listing provided courtesy of David Rosales of Coachella Vista Realty, Inc.